Help kids on your next Costco trip! Visit participating Costco locations in eastern Massachusetts or southern New Hampshire from May 1 through 31, and donate $1 or more to Boston Children’s—your local Children’s Miracle Network Hospital! Donate $1 or more to Boston Children’s through May 11th at participating Walgreens locations in eastern Massachusetts and southern New Hampshire. From March 24 - May 11, donate $1 to Boston Children’s at participating Ride Aid locations in eastern Massachusetts and southern New Hampshire. From April 19 - May 12, donate $1, $5 or more to benefit Boston Children’s at participating Circle K locations in eastern Massachusetts and southern New Hampshire. From May 20-24, donate or round up your purchase to benefit Boston Children’s Hospital at all Speedway locations. During April, round up your Ace Hardware purchase to the next dollar as a donation to Boston Children’s Hospital. 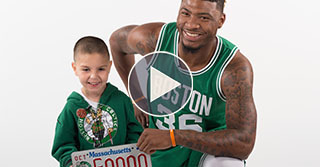 Brody and Marcus present the Boston Celtics License Plates benefiting Boston Children's Hospital. Celebrate Boston Children’s hometown basketball team. 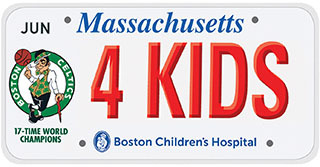 Purchase a Boston Celtics license plate and 100% of the proceeds will support hospital programs. AmazonSmile offers the same products, prices and services as Amazon. Shop year-round through the link below and a portion of your purchase will benefit Boston Children’s.